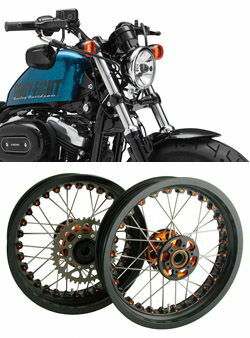 The unique and proven Kineo system enables the 'Classic Spoked Look' to be available for your Harley Forty-Eight XL1200X... but with all the dynamic handling and safety benefits provided by modern tubeless tyres. They are also fully compatible with tubed-type off road tyres too. !harley, davidson, davison, harleydavidson, fortyeight, fourty, eight, fourty-eight, fourtyeight, sportster, xl1200, xl1200x, xl1200l , 1200, sportster, 48, 13, 14, 15, 16, 17, 18, 19, 20, 2013, 2104, 2015, 2016, 2017, 2018, 2019, 2020!